Loop puzzles are the class of puzzles that require you to draw a loop of some sort. The rules vary, but in all the different types of loop puzzle you must form a single loop such that if you depart from any point on the loop you will ultimately arrive back at that point. With some loop puzzles you are required to visit every square in the puzzle, whilst in other puzzle types this requirement is not there. The simplest type of loop puzzle is called simple loop or simply loop finder. The rule with this puzzle is to draw a loop that visits every square in the puzzle, with no other rules at all. There may be some cells that are already filled in with loop parts to start you off, and there may be some cells that are filled in that are not part of the loop at all. Another of the four most usually seen loop puzzles is slitherlink. This puzzle perhaps has the most depth of the various different loop puzzles and there are so many different patterns and interactions between parts of a puzzle that you learn to spot whilst solving these puzzles. They can be quite intimidating the first time you try one unless it is very easy, but it is particularly satisfying to persist with solving slitherlink as they soon become very enjoyable, and as mentioned for a long time you will spot new inferences and deductions you can make whilst solving different puzzles. In slitherlink certain cells are marked with a number from 0 - 3 and this tells you how many sides of that cell are touched by the loop. The loop does not have to visit every cell. So with a 0 no sides of the cell are touched by the loop, with a 3, 3 of the 4 sides are. Masyu is the third of the more commonly seen loop puzzles, although it is actually not that common to see it in publications (though it is probably more common than the final type to be discussed below). In masyu there are two types of counter: white and black counters. With a white counter the loop must pass straight through the cell that contains the counter, but then must turn 90 degrees in at least one of the cells either side of the white counter. With the black counter, the loop must turn 90 degrees immediately in that cell, but then extend straight through at least one cell either side. 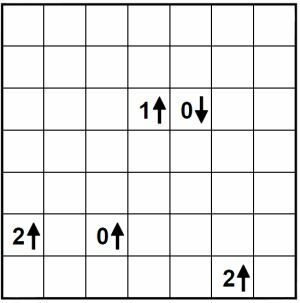 Although it sounds complicated once you get the hang of the rules masyu is a fun puzzle, and again there are lots of little deductions that you soon spot and learn to use to quickly make inroads into solving a masyu puzzle. The fourth loop puzzle this world of puzzles blog post discusses is yajilin. A sample start position of a small yajilin can be seen in the image at the top right of this post. In yajilin, the loop must pass through every cell in the puzzle that is not either filled in black, or is a clue cell. Clue cells consist of an arrow and a number. The number indicates how many cells in the direction of the arrow are filled in, and therefore the loop does not pass through. The rule is that filled cells cannot touch each other horizontally or vertically. It is interesting how relatively few pieces of information are needed to solve many yajilin puzzles. With all of these puzzles there should be only one possible solution, and it should be possible to reach it without guessing, although particularly with many slitherlink you do sometimes find that you need to work through sections of loop in your head in order to spot where you may run into trouble, but you should not just simply have to recursively check how the loop proceeds through trial and error. What is your favourite loop puzzle and why, or perhaps you know of another loop puzzle or a particularly clever solving method for one of the puzzles mentioned? If so then please do share it in the comments section below!